Over the past few months, gouache has become my paint of choice. 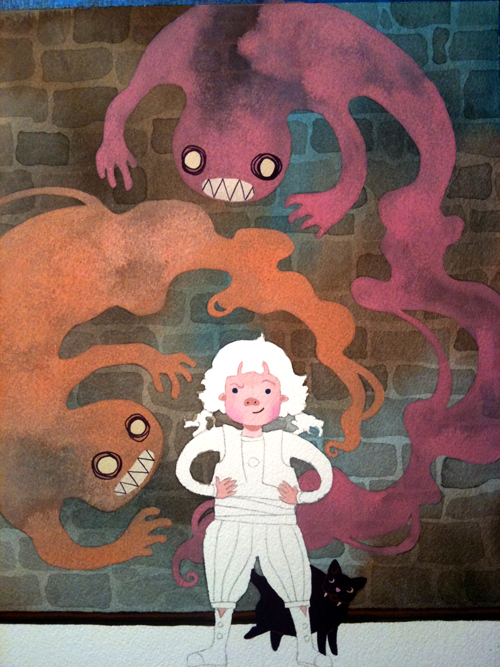 I decided to do my entire body of thesis work in gouache, even when I hadn’t quite figured out how to use it yet. Whenever I tell people that I use gouache, I’m most often given a quizzical look; it’s not an extremely popular medium like oil or acrylic, and doesn’t follow the same rules as watercolor. To me, that’s the beauty of it. Depending on the thickness of the paint, I can work it like watercolor, or get it thick enough to look like acrylic. It can be extremely versatile, and simultaneously forgiving and finicky. 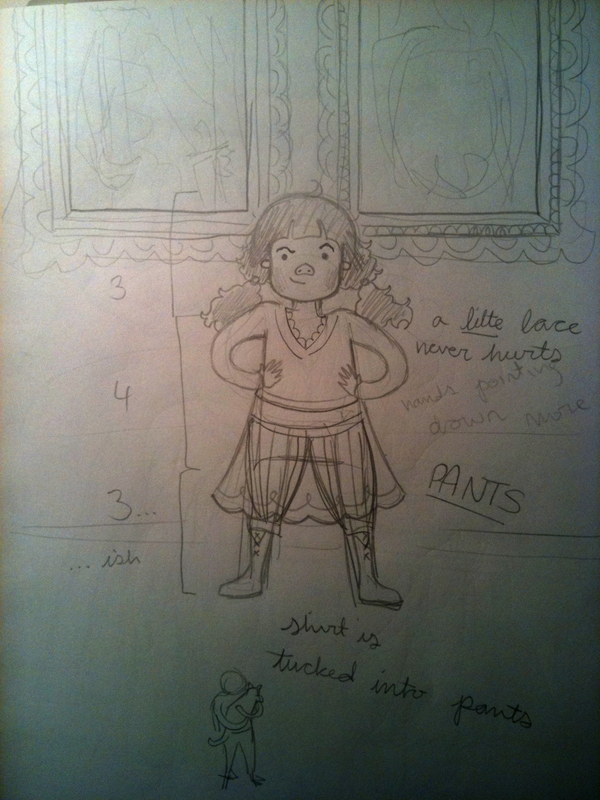 Here is a (hopefully) quick step-by-step guide to the way I go about putting together a painting. I apologize for the poor quality of the photos; working at night + taking pictures with my phone = no bueno. I decided it was time to paint a girl like one of them. Then, a sketch. 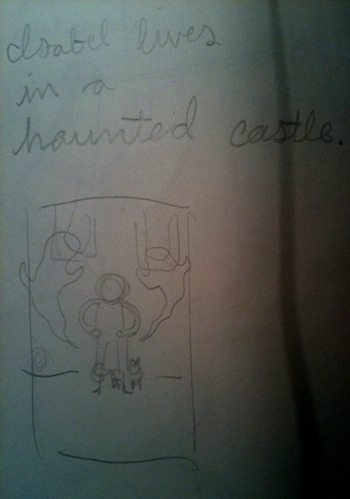 I originally had the girl (henceforth known as Isabel) standing in front of two portraits as a pair of ghosts swirl over her head and a cat rubs against her leg. I debated having her hold the cat, but that would ruin her defiant pose. I take notes for myself around the sketch; it helps me organize my thoughts and generate ideas. I always do my final sketch on tracing paper; this way I can preserve parts of my sketch that I like, and clean up and shift other things around (you can see I slightly tweaked the positioning of her hands). The portraits have been taken out to put more focus on the ghosts. I’m still leaving myself notes at the bottom. 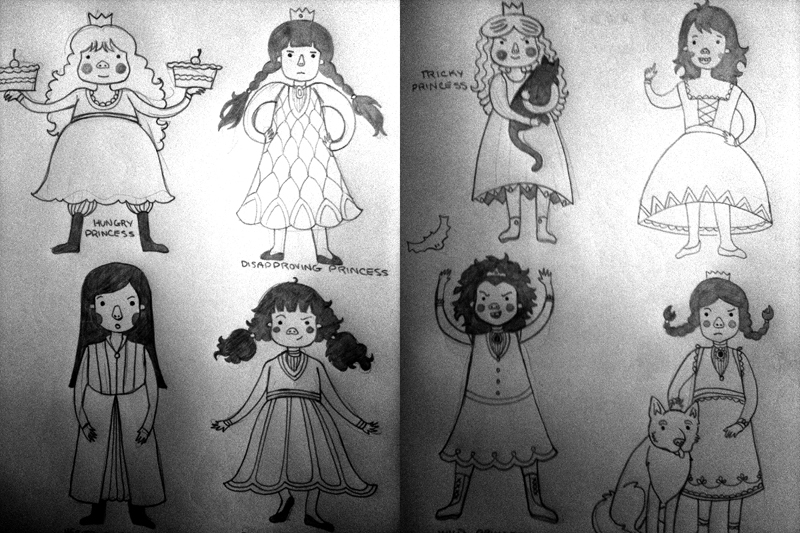 The ghosts were only put in roughly; they will be given more expressive shapes later that are better to do freehand than trace. 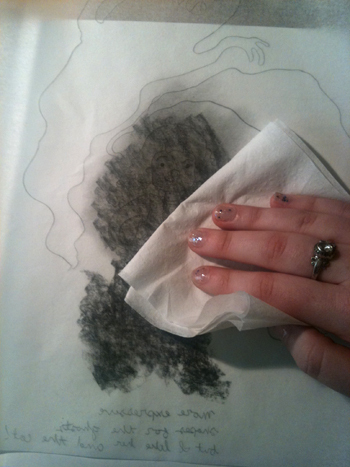 …and wipe away the excess graphite dust with a paper towel. 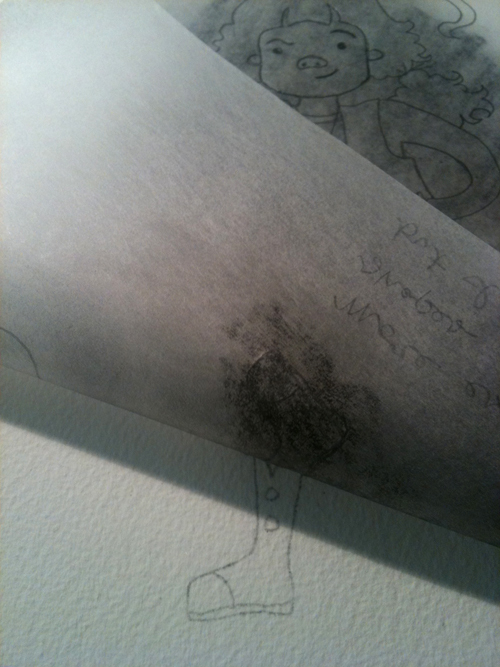 This way, the extra dust won’t leave any smudges on the paper during the transfer process. To transfer, simply put the sketch right side up on your watercolor paper, loosely tape in place (so the paper doesn’t get damaged) and simply trace back over your drawing with a pencil. 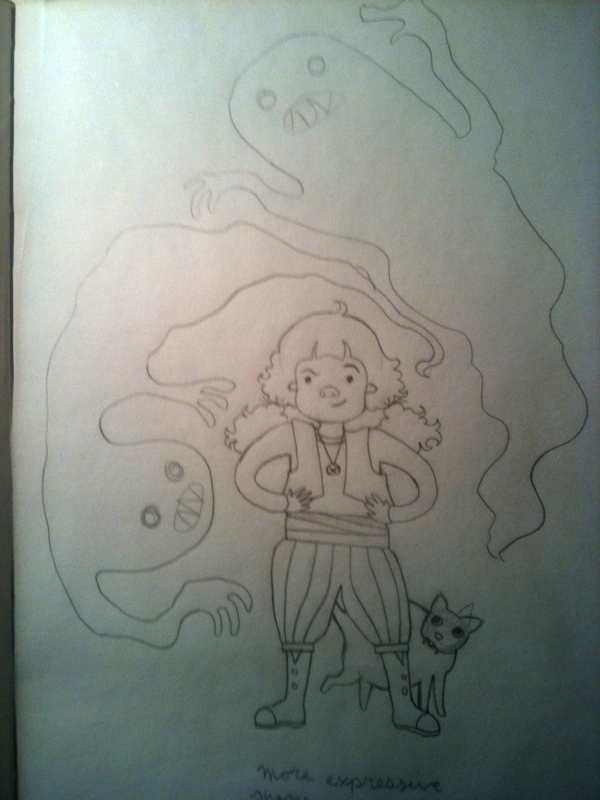 After I finish transferring Isabel and her cat to the paper, I go back and redraw the ghosts. Aren’t they more dynamic now? It’s time to start painting. The best way to use gouache, in my opinion, is to work from least to most opaque parts. That way, if paint leaks over to space where it shouldn’t be, you can just cover it up when you go in the paint opaquely. 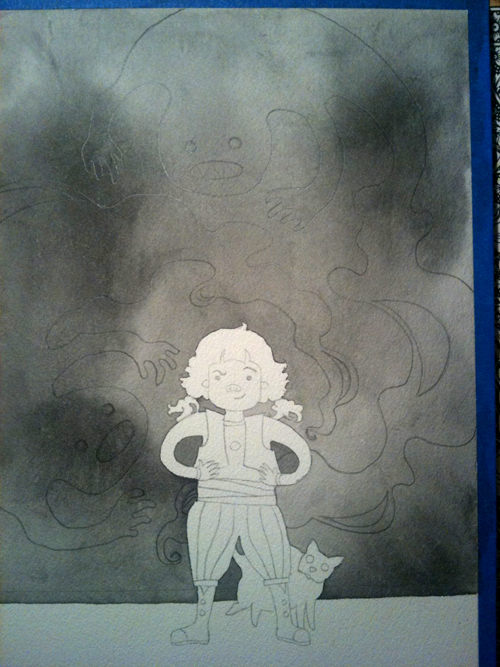 I want my ghosts to be see-through (as all proper ghosts are), meaning I can’t do the space behind them in gouache. Why you ask? Because gouache melts when it’s rewetted. I fear transporting my paintings when it’s raining out, and have seen massive damage done by a single drop of water. I sometimes have sick daydreams of taking a completed painting over to the sink and just rinsing it off until I’m back to having just a drawing on my paper. 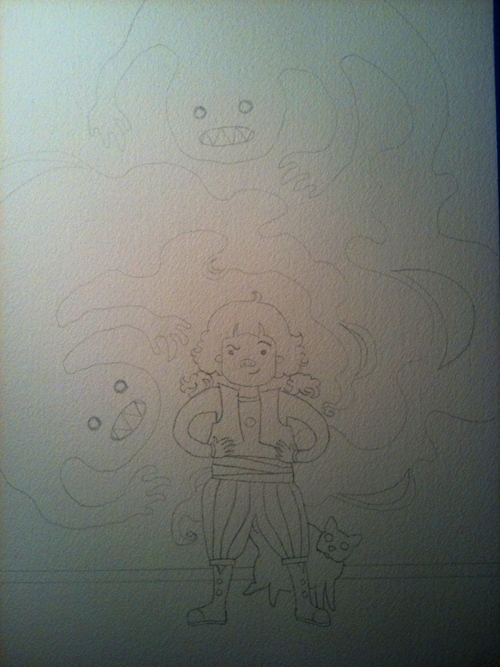 Were I to paint the background in gouache, it would melt as soon as I attempted to paint the ghosts on top of it. So what doesn’t melt? Blue tape, mechanical and wood pencils (HB or harder), graphite stick, cheap Pelikan gouache set that, as the paint runs out, is supplemented with Designer’s Gouache (in the rad 80’s styled tubes), acrylic ink, calligraphy ink, sumi ink, and brushed of various sizes and shapes, from a size 000 to the monster at the end. 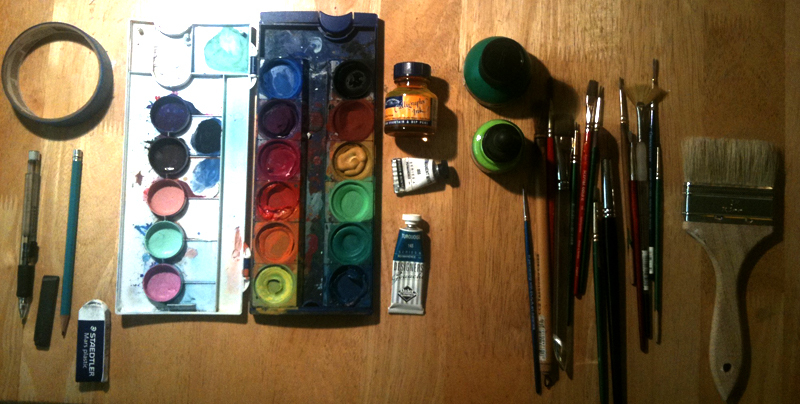 I only clean my palette about once a year (you can see the colors from my last painting are still in there). So: ink. I find that calligraphy ink can’t take as much abuse, with brush scrubbing and layering and whatnot, than acrylic ink. Acrylic ink, however, should be diluted with water; otherwise, it becomes a waterproof surface, and no good for layering (unless you want it to be seen under thick layers of paint). Most of the time, I simply lay down a thin wash of ink to use as a base color and to set the tone of the piece. In this painting, however, it will be used to do some detail work as well. See? Doesn’t the painting already look a bit creepy? As soon as the ink is dry, I start to put more details in. 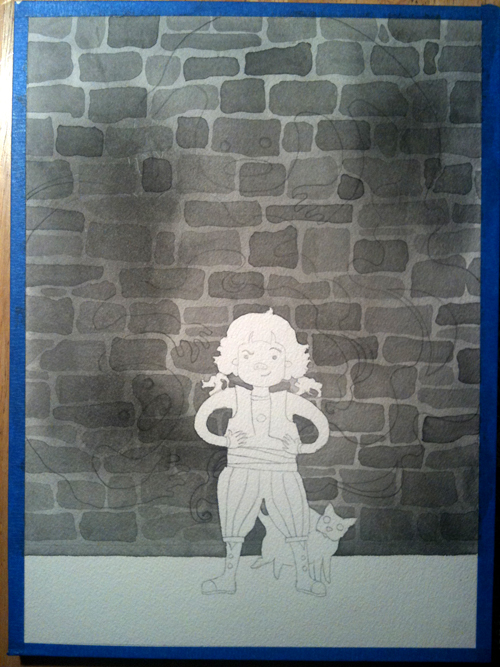 The rocks are all put in with more watered down sumi ink. Darker rocks are made not by changing the ink to water ratio, but by putting more ink down on the paper itself. A deeper “puddle” of ink = more pigment = a darker color. 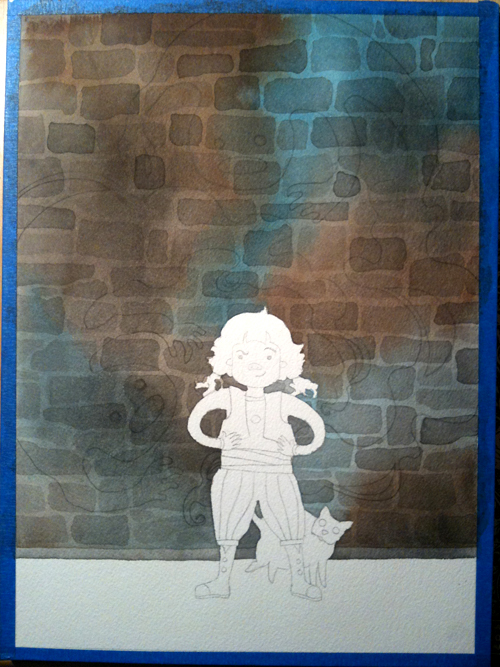 As soon as that’s dry, I add a layer of color with brown and blue different calligraphy inks, still very watered down. 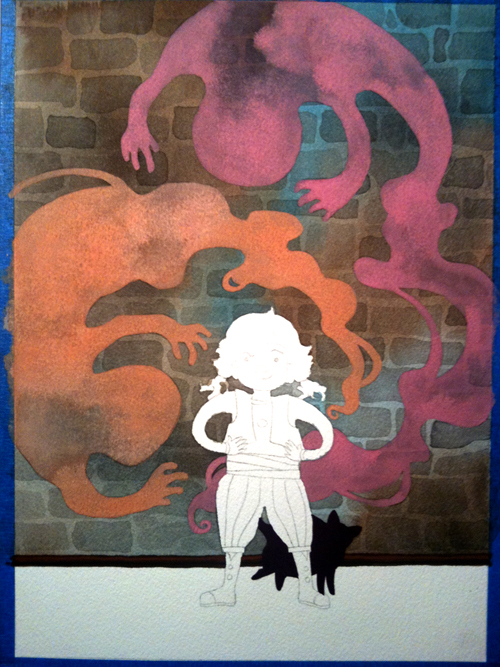 This is when I switch to using gouache. I mixed it fairly thick for higher opacity; another way to make paint much more opaque is to add a little white to it, which I did. The parts of the ghosts that appear more solid have the high opacity paint on them; to make them see-through, I’ve simply grabbed a bit of water on my brush instead of more paint. I’ve also blocked in the shape of the cat. He was done with the most opaque paint yet, with a consistency like nearly melted ice cream. I’ve covered up the details in his face, but that’s okay; I’ve still got my sketch to use as reference, and I can put his face back on freehand. Time to add some details…. Uh-oh! That’s not a great hair color. This is what I get for making up my color palette as I go along. When I do pick my colors before I start painting, Kuler is a great reference. Isabel is done almost entirely in very thick, opaque paint (“opaque” is the word of the day). One of the great things about gouache is that, if I make a mistake, it’s not too difficult to cover up; all you need is at most two layers over it to cover up the mistake. I saved the offensive hair color and used it for Isabel’s pants, and later made it darker for her shirt. 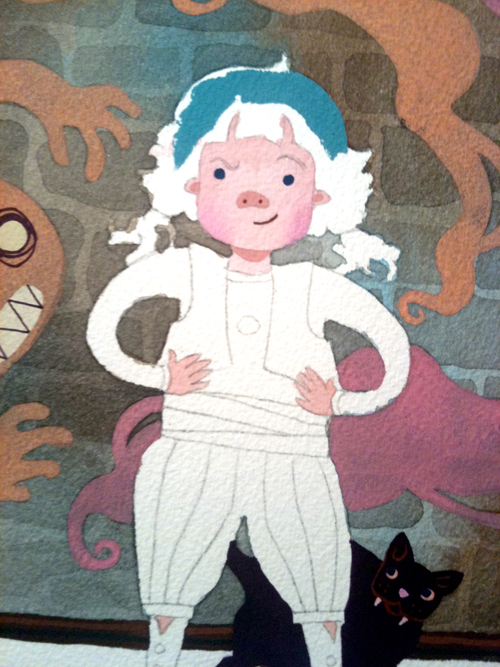 That’s really my only explainable secret to making colors in a painting cohesive; they’re all variations of each other. 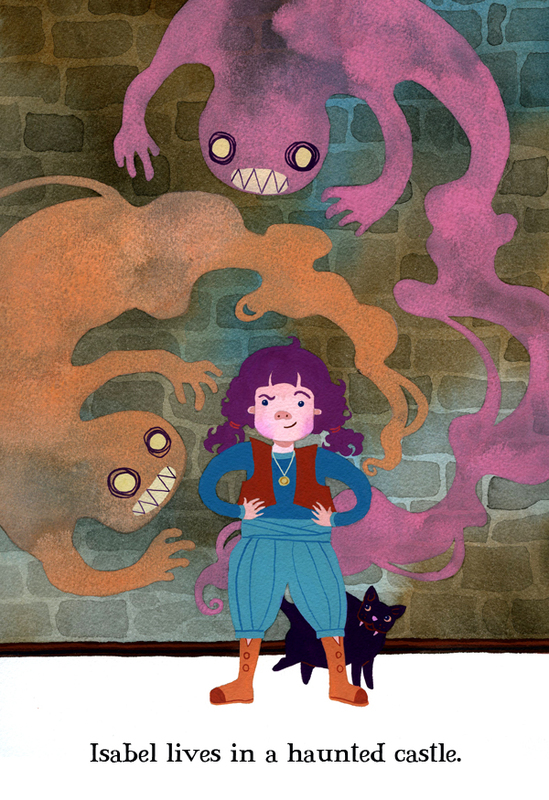 Her shirt color is from her pants; her vest is from her shoes; her shoes and hair are from the ghosts. My little concept sentence has made it all the way to the final. Thank you for making your way through this (if indeed you have)! Please feel free to ask any questions or make any comments. this was a really helpful post. so now i dont know. (you convinced me, even though your original anibets looks really really neat. no colour outside the lines. all tidy). i’ve run out of acrylics at the moment anyway. and its a fiddle when they dry up too quickly to get any kind of shading.